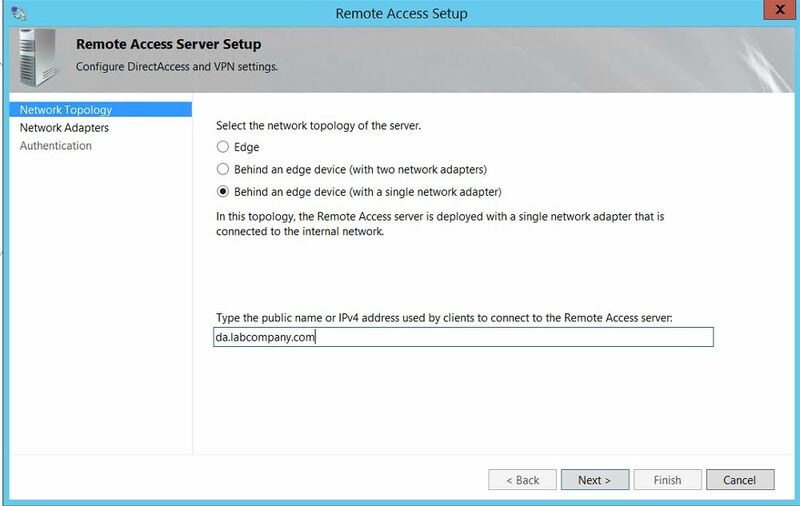 My Step-by-Step DirectAccess Configuration on Windows Server 2012 R2. | Chinny Chukwudozie, Cloud Solutions. a) It hugely facilitates the process of implementing the Password expiration and change Group Policy for telecommuter users. c) Help desk administrators can more easily administer telecommuter end user ticket issues(Manage out capabilities). d) Securely and seamlessly extending my I.T. infrastructure environment over the internet.IPSec and HTTPS(SSL certificate) encrypt the traffic between client and DirectAccess server to prevent interception. 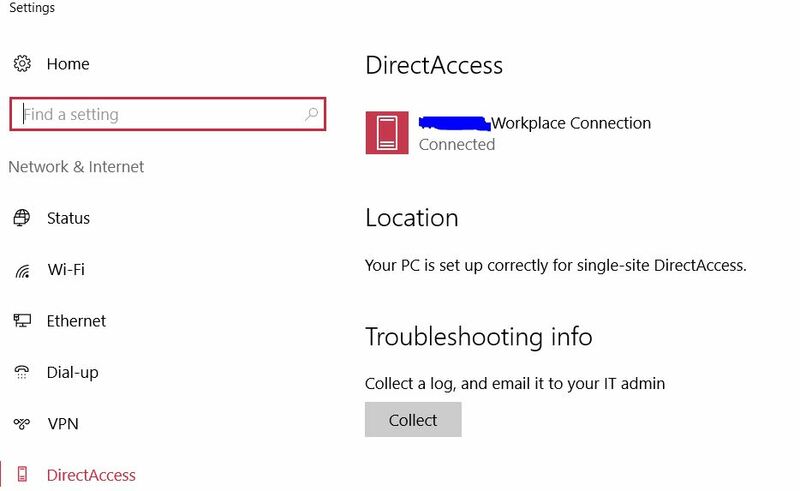 In addition, Windows Firewall must be enabled end-to-end before a successful DirectAccess connection can be made. e) DirectAccess utilizes IPv6. 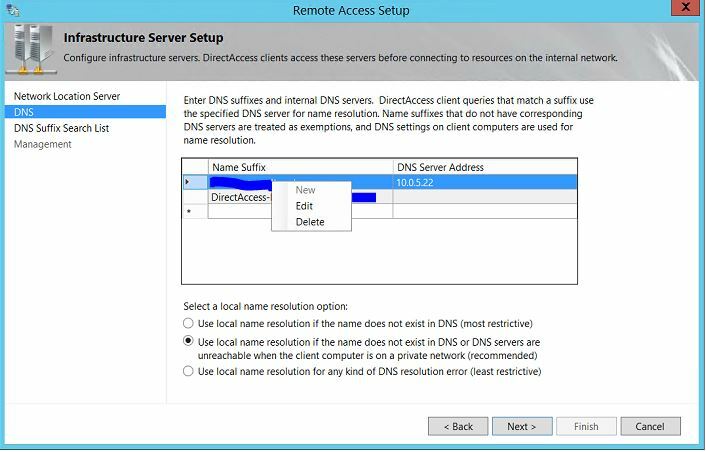 Since Windows Server 2012 DirectAccess can now be configured behind a firewall using NAT (Network Address Translation) with a single NIC. This deployment model requires the IP-HTTPS transition technology. The following sections outline my Configuration and deployment steps. 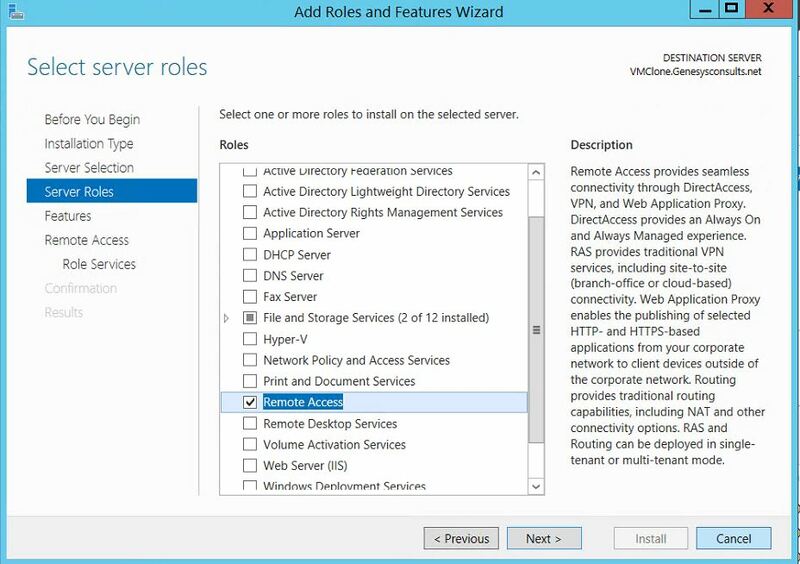 Start by provisioning a Server 2012 R2 virtual machine on a Hyper-V host (any hypervisor host will do) . The Virtual Machine is configured with the option of a single network adapter. Join the server to the domain and configure it with a static IP Address matching your internal subnet. Download and install the operating system updates. This machine will be configured later as the Direct Access Server. 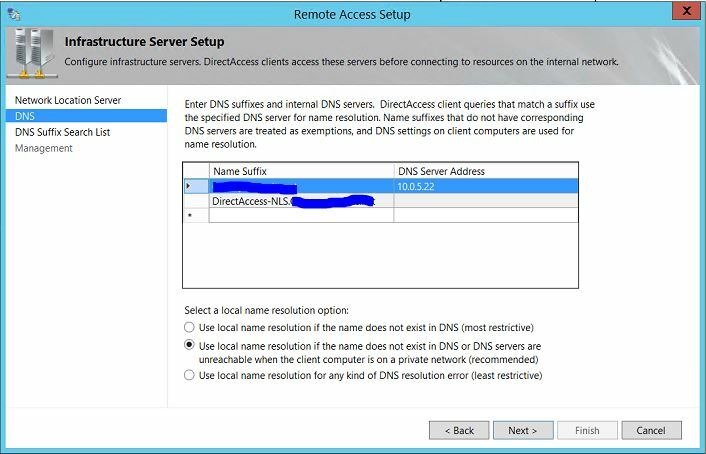 Create a public DNS record with your DNS provider or your public DNS server. In my case, I created a da.labcompany.com. This DNS record will be configured later on the Company firewall to point to the DirectAccess server . The DirectAccess service primarily needs port 443 to be configured on the perimeter firewall. 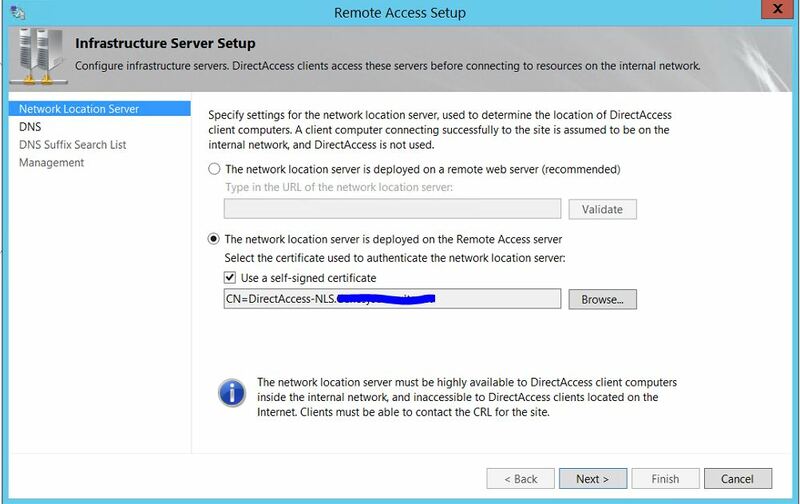 Configure a NAT policy and Firewall access rule for port 443 to point to the internal DirectAccess virtual machine’s IP Address. The DirectAccess security model depends hugely on certificate services. I started out by trying to deploy Active Directory Certificate services and configuring CRL (Certificate Revocation List) distribution points . It’s an involved process I hope to blog about soon. But for this post, I used a public wildcard SSL certificate acquired from Godaddy. Make sure the certificate Subject name matches the the fqdn of the DNS record in step 2 above “da.labcompany.com”. My wildcard ssl certificate is “*.labcompany.com”. Download the certificate and import into the DirectAccess server personal certificate store using the Certificates mmc console. Using a certificate issued by a public CA like Godaddy is recommended. It spares you the long and involved task of configuring an internal certificate revocation list distribution point for access from the internet. Add-ADGroupMember -Identity DirectAccessComputers -Members "CN=W10LAPTOP,OU=IT,OU=Hardware,DC=labcompany,DC=net"
DirectAccess is enabled solely on the Enterprise versions of windows clients OSes. Windows 7 Enterprise and Ultimate, Windows 8.1 Enterprise and Windows 10 Enterprise. In my environment, we are in the middle of a Windows 10 roll out for all clients. For this reason my DirectAccess configuration is targeted towards Windows 10 Enterprise clients. This eliminates the need to configure workstation authentication certificates for Windows 7 Enterprise clients. 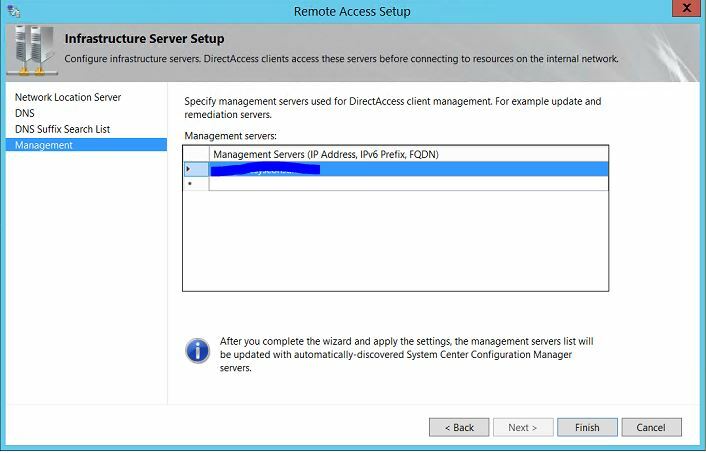 Click to add features and continue to click “Install” to install the DirectAccess role service.A restart is not required after the installation.Open the Remote Access Management console under the Tools tab in Server Manager to start the configuration of DirectAccess. 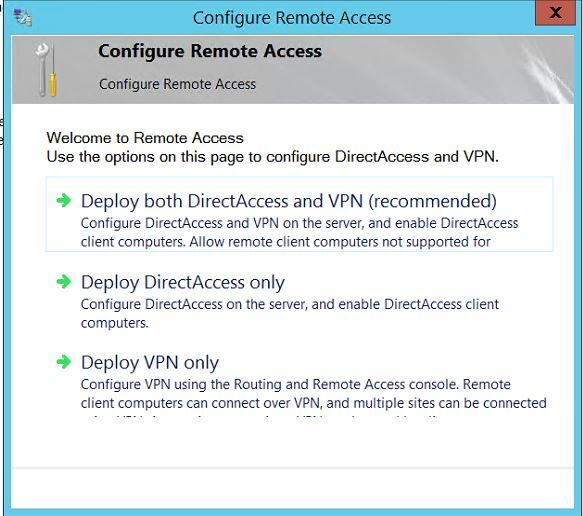 In the Remote Access Management console, select the DirectAccess and VPN role service and click on the “Run the Remote Access Setup Wizard”. 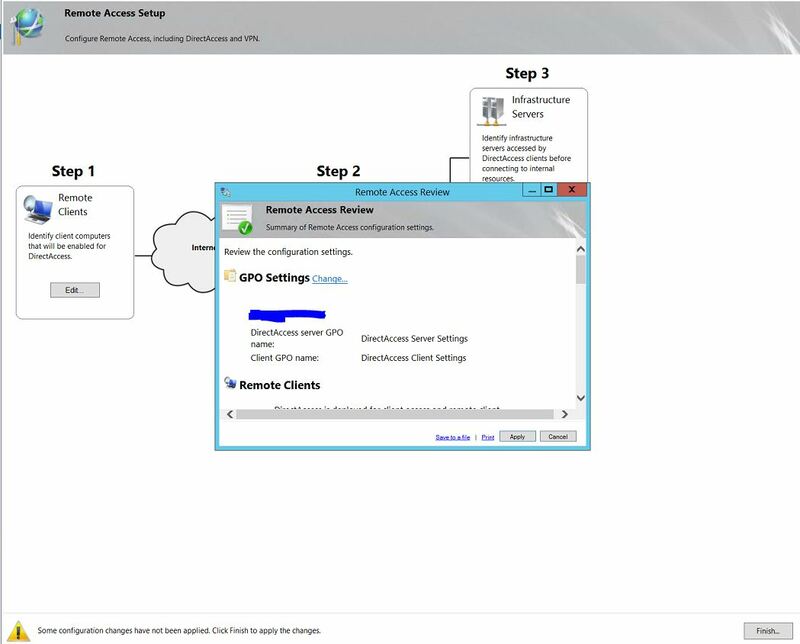 a) After the prerequisite check, on the Setup page, click configure on the Step 1 task to configure remote client settings. 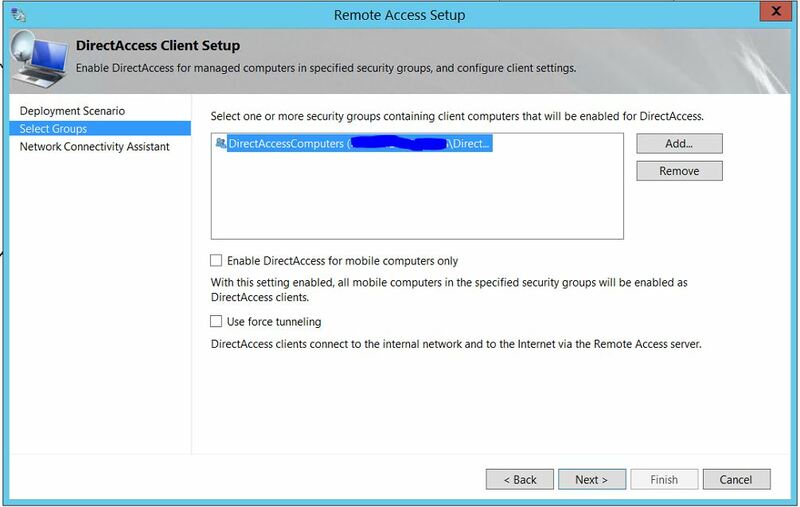 On the DirectAccess Client Setup page, select to Deploy full DirectAccess for client access and remote management. Click next. 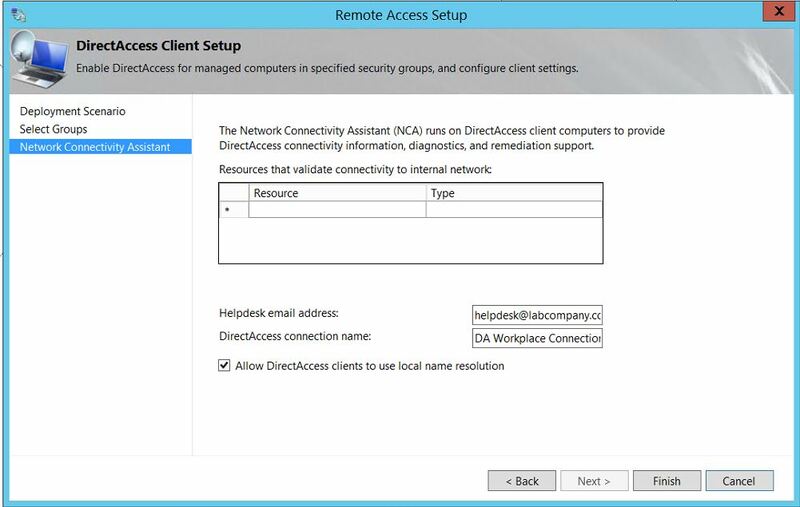 On the “Network Connectivity Assistant” page, enter a Help desk email address and rename the DirectAccess Connection name if needed.Select the ‘Allow DirectAccess clients to use local name resolution” option.In the table, add a resource that will be used to determine connectivity to the internal network. A default web probe is created automatically if no other resource is configured. 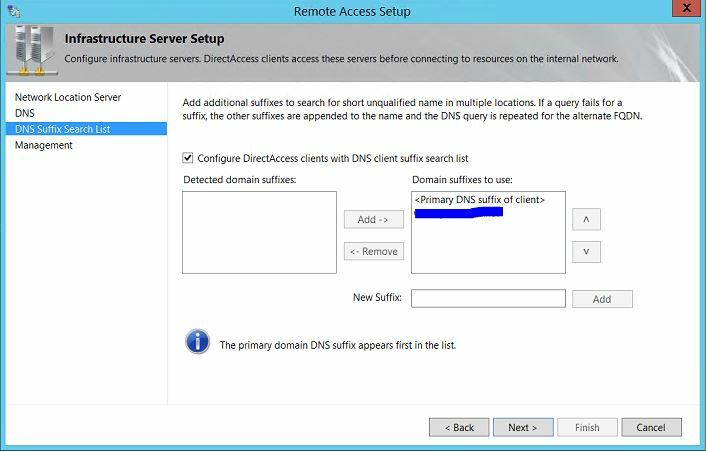 You can configure this task with the fqdn of a domain resource that can be reached via ping or port 80 http. I left the table blank to let DirectAccess configure a default web probe on the DirectAccess server. Click finish. d) On the ‘Authentication’ page, select to use “Active Directory Credentials” for user authentication. I don’t need to enable DirectAccess on Windows 7 clients since my clients are running Windows 10 Enterprise. I don’t need to enforce compliance for NAP at this time. Click finish. On the “DNS Server Addresses” page, enter the dns suffix name of your internal network and click detect, then click validate. The IPv6 address will be added automatically. 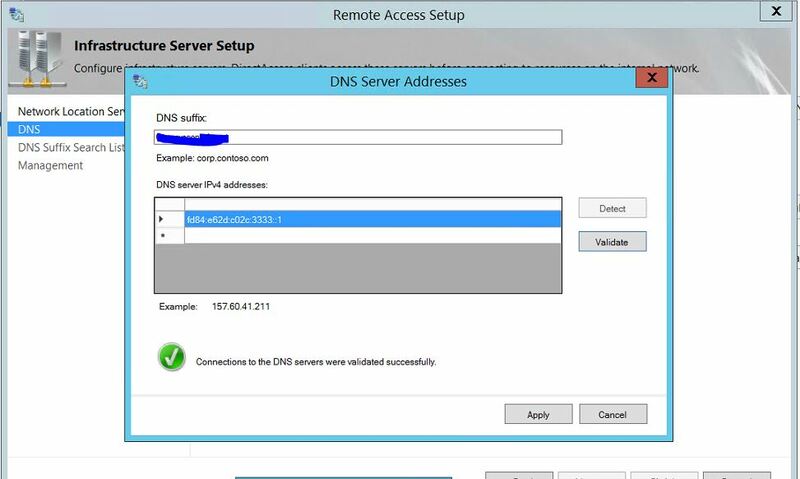 Click Apply to continue.This is the IPv6 address of the DNS64 service running on the DirectAccess server, which is how the DNS server should be configured for proper DirectAccess operation. 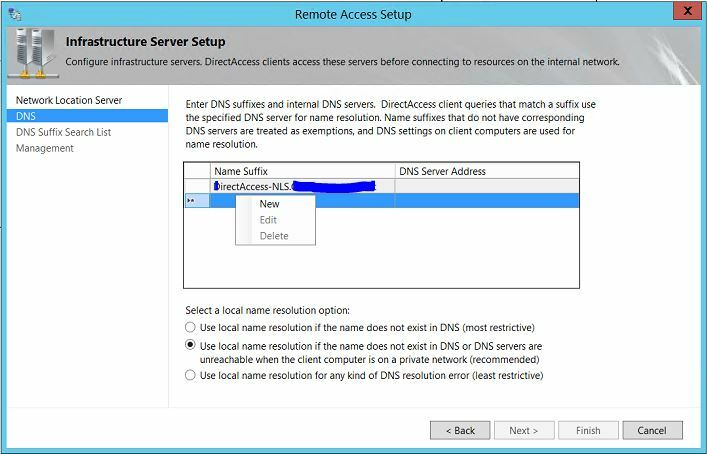 For the local name resolution option, select the recommended “Use local name resolution if the name does not exist in DNS or the DNS servers are unreachable when the client computer is on a private network” and click next. Click finish on the Remote Access Setup page, save a copy of the settings to the desktop for later viewing and click Apply. 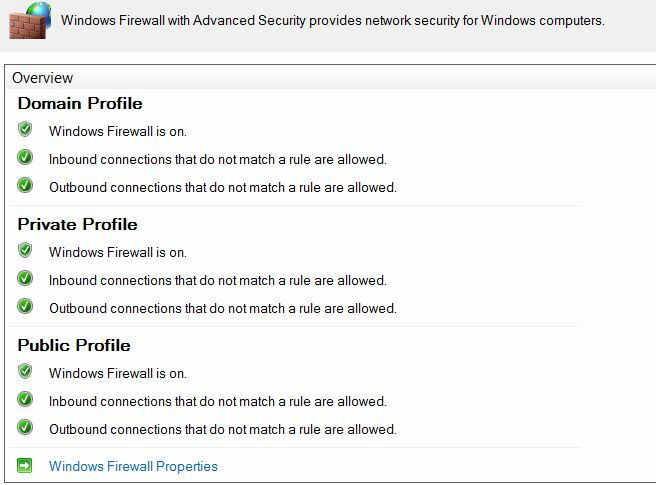 1) “Firewall-Settings-DirectAccess-Server” is linked to the DirectAccess Server OU and security filtering was applied specifically to the DirectAccess Server. 2) “Firewall-Settings-DirectAccess-Clients” is linked to the DirectAccess Clients OU. The security filtering was applied to the ‘DirectAccessComputers’ Active Directory Security group. 1) Netsh advfirewall show and Netsh advfirewall set cmds. 2) Get-NetFirewallProfile and Set-NetFirewallProfile cmdlets. 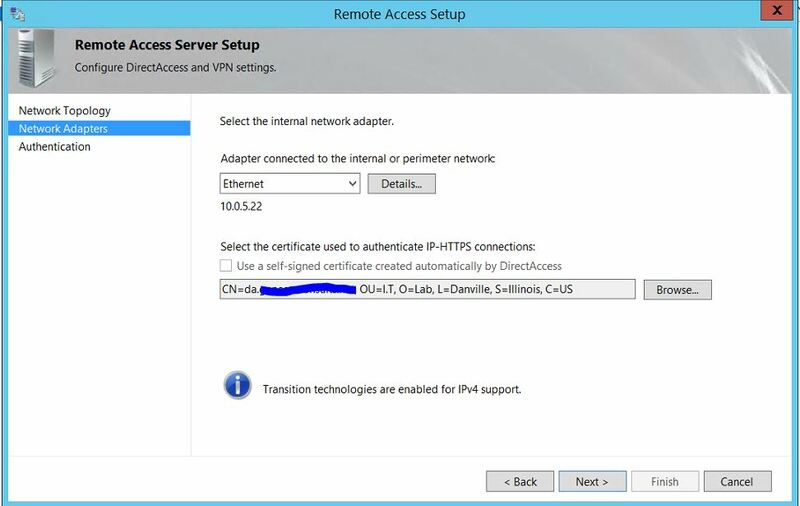 This entry was posted in DirectAccess, Powershell 4.0, Remote Access, Windows Server 2012 R2 and tagged Certificate, DirectAccess, DNS64, Firewall Profiles, Group Policy, IP-HTTPS Transition Technology, IPv6, Local Store, NCA, Netsh advfirewall, Network Location Server, NLS, Nrpt, PowerShell 5.0, Remote Access, SSL, WIndows 10 Enterprise, Windows Firewall. Bookmark the permalink. 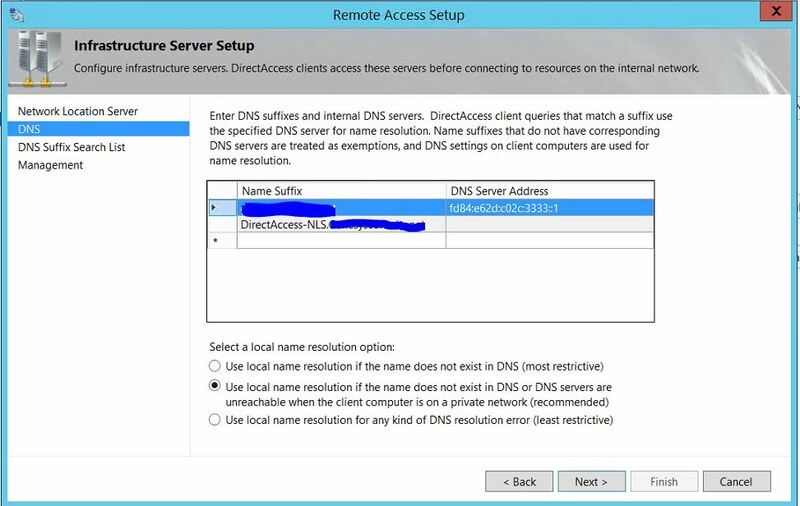 8 Responses to My Step-by-Step DirectAccess Configuration on Windows Server 2012 R2. Your article is detailed and thorough as usual! Hey dude, good to hear from you. Thank you very much for the comment man. Thanks for the comment Henrik. And for stopping by my page. Appreciate. I am facing issue with direct access connectivity please guide me. I have DC and Direct access server on the same server and using single NIC and DA working fine in internal network for the External network I am having issue only the vpn connected. please advise me. My clients are able to access internal resources just fine. My problem is I can’t access the clients so I can’t connect or remote into them. I have my firewall turn off org wide. From what I’ve read that’s the problem. Ok, so I turned it on for a single test client. All three profiles are on. I allow all out and all in. I have two rules setup that allow all from any to any both inbound and outbound. so basically it’s like having it off except it on and allowing everything. Now the client cannot access any internal resources and I still can’t see them either. If I turn off the firewall service on the client it goes back to being able to access resources. This is driving me nuts. If everything is allowed I can’t figure out it would stop being able to access anything. Thanks for the article, clear and concise, and was very helpful in my decision to pass on it. 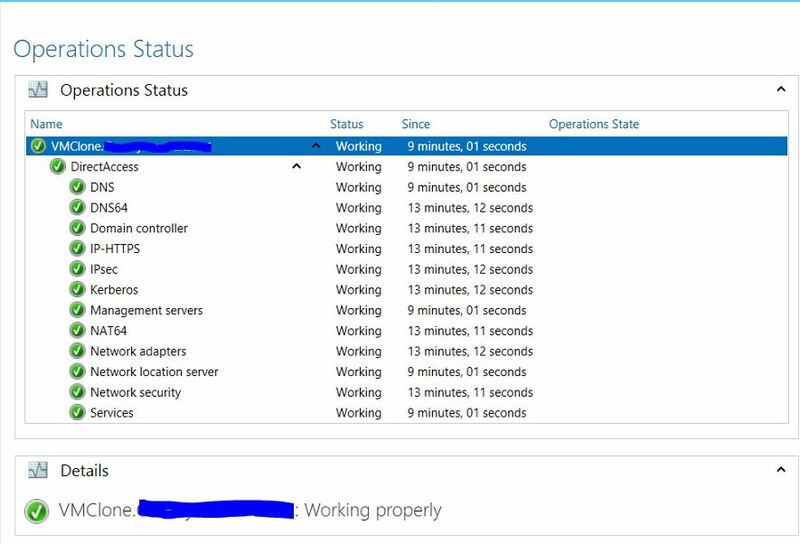 I have to disagree with your opening statement, “Windows Server DirectAccess is an awesome and exciting feature.” All this work (and 14 potential problem points), so the end user has one less button to click? Plus, an extra $100 per mobile device for the Enterprise version? VPN only takes 15 minutes to configure. Again, thanks for the time to write this excellent step-by step. Enterprise Only client OS is the deal breaker for me. 1+ for hardware VPN firewalls.